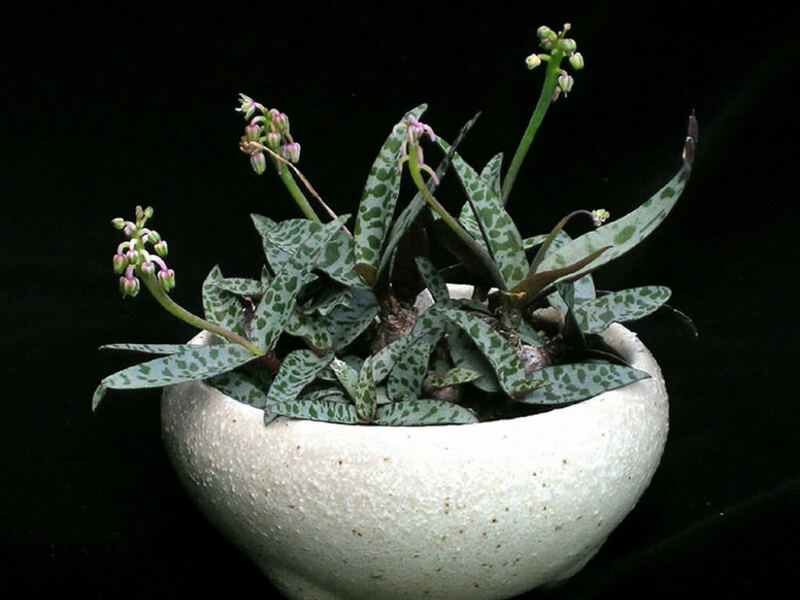 Ledebouria socialis, commonly know as Silver Squill, is a geophytic species of bulbous, perennial plant native to the Eastern Cape Province of South Africa. It grows in arid savanna in summer-rainfall regions where it is found in fine to medium grained shallow to deep well drained humus rich sandy soil. It usually grows in shade mostly in closed evergreen woodland. The plants make interesting houseplants that are colorful and structurally unique. Silver Squill has unique teardrop shaped bulbs that form above the ground. They look like little purple bladders and can store moisture in times of drought. The leaves spring from these structures and are lance shaped and silver spotted with purple undersides. In summer, pink stems form bearing small greenish flowers. The entire plant only gets up to 10 inches (30 cm) tall with a rosette formed from foliage out of the bulbs. It is favored by succulent growers, but it is not a succulent, although it resembles one and has the drought tolerance of the group. Silver Squill is often cultivated as houseplant and grows well with minimal care. It requires bright light with 3 to 4 hours a day of direct sunlight. During the active growth period, interior temperatures are fine for Silver Squill’s grown as houseplants. Outdoor plants can withstand winter temperatures down to 30°F (-1°C). Try growing Silver Squill outdoors during spring and summer when ambient temperatures are at least 60°F (15°C). In cold regions, move the plant back indoors. Use a soil based potting mixture and plant Silver Squill bulbs in pans or half-pots. Pot up the bulbs in the spring, but no more than 3 bulbs in a single 4 to 6 inches (10 to 15 cm) pot. Space the bulbs evenly over the surface and bury only the bottom half or each bulb in the potting mixture. During the fist 4 or 6 weeks do not feed the plants and water sparingly, allowing the top half or the potting mixture to dry out between waterings. When the new roots should be well established, treat the plants in the normal way. Break up overcrowded clumps every 2 or 3 years. Once established, water needs are minimal. Allow the top inch (2.5 cm) to dry out before irrigating in spring and summer. Once winter has arrived, the plant is in its rest phase (dormancy) and watering should be cut in half. During the growth season, apply liquid fertilizer once per month. Growing Silver Squill is extremely easy. Those bulbs that were mentioned will increase over the years until the plant is crowded in its pot. The next time you repot it, you can separate away some of the bulbs to start new plants. Wait until flowers have faded, unpot the plant and gently break away the bulbs. While Silver Squill propagation is possible through seed, germination can be capricious and growth is very slow.